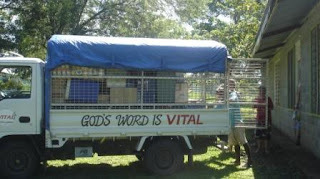 I drove for the first time on a real PNG road this week...in this truck!!! A couple of weekends ago at Ukarumpa, I browed a van and practiced driving a little bit around the center in a little van that had a gear shift on the steering column ~ that took a little getting used to ~ but for the most part I did remember to stay on the correct side of the road, which is left in PNG. On Wednesday I started out driving for about 20 minutes on a lightly used road, driving in from Hagita, where our VITAL course takes place. 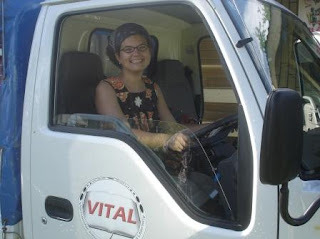 This time I was driving a fairly good sized truck, and the gear shift was on the floor...on my left. Constantly shifting up and down as I negotiated the turns and avoided potholes gave me a good amount of practice. Rather brings back memories of learning to drive for the first time at home, when, after a few minutes practice in a parking lot, my dad directed me out to the highway that runs through town and, though I was petrified, I had plenty of oppotunities to shift up and down at between each stoplight. Anyways, today after my 20 minutes of accompianied practice, I was sent off on my own into town to get fuel and a few other things. I was able to stay on the correct side of the road; which I learned is easy to remember if you keep in mind that the driver is always closest to the middle of the road ~ no matter what country you are in. However, one of the great things about PNG is that there aren’t too many cars on the road, so if you need to slip over into the oncoming traffic lane to avoid a pothole, it is perfectly ok (as long as there is not a car already in that spot!). As the “buyer” for this VITAL course, I expect to have plenty more opportunities to drive to and from town, picking up supplies—by the end of February I should be a driving pro!